Seribu Islands District is providing free homecoming program to Sebira Island people.
" Alhamdulillah (thank God), we can facilitate people who want to take homecoming towards Sebira Island and vice versa"
On that occasion, Seribu Islands Regent, Irmansyah has released free homecoming towards Sebira Island at Marina Pier, Ancol, North Jakarta, Wednesday (6/13). According to him, it is the aspiration of Sebira Island people. Because it is the furthest island, so if it uses a ship, it will take a long time. 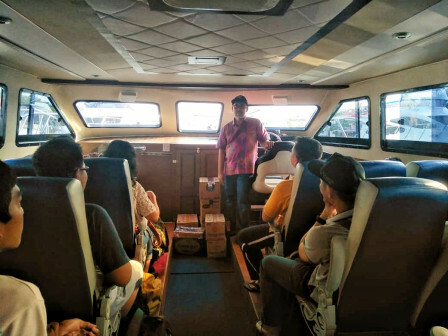 "Alhamdulillah (thank God), we can facilitate people who want to take homecoming towards Sebira Island and vice versa," he stated, at Marina Pier, Ancol. It is also the mandate of Jakarta Governor and its partner whereby the government can play a role in the society. "In future, if our transportation is already better, all will run well. But so far all goes well, so why not we give them facility," he exclaimed. In the meantime, Nurlia (31), one of Sebira Island people positively welcome the program. "Hopefully it can be realized every year," she hoped.